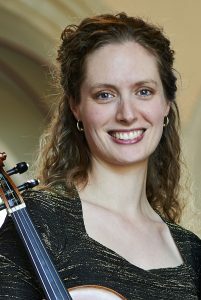 Karina Schmitz, viola, is principal violist of Handel and Haydn Society in Boston, principal violist of Apollo’s Fire, the Cleveland Baroque Orchestra, associate principal violist of the Carmel Bach Festival Orchestra, founding member of 17th – century ensemble ACRONYM, and violinist/violist of Duo Corbetta. Based in Boston, Karina holds degrees from New England Conservatory and the Cleveland Institute of Music. Her early music studies began at Oberlin Conservatory with Marilyn McDonald, Miho Hashizume and David Breitman. She continued her training in the Apollo’s Fire Apprentice Program in Cleveland while serving as concertmaster of the Case Western Reserve University Baroque Orchestra. She has played with the Boston Early Music Festival Orchestra, Boston Camerata, Blue Heron, Les Delices, Oregon Bach Festival, the American Opera Theater in Washington, D.C., the Trinity Consort in Portland, OR, the Rutland Baroque Orchestra in Vermont, the Dryden Ensemble, and the Harvard Baroque Orchestra.